The 29th Installation Ceremony of Rotary Club of Port Blair under Rotary International district 3291 was held on Sunday the 24th July’11 at Fortune Resort Bay Island, Marine Hill. 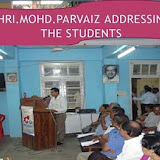 The Principal Secretary, Shipping, Shri. Jalaj Shrivastava was the chief guest of the well organized function. Rtn. Zakir Jadwet was installed as the President and Rtn. Girish Arora as the Secretary of the club for the year 2011-12. Speaking on the occasion the outgoing President Rtn. Anil Goel showcased all the activities during the year through a power point presentation. Varoius awards from the District were formally presented to the club. The incoming President Rtn. Zakir Jadwet briefed on his vision for the year 2011-12 and encouraged the club members to support and join him in his endeavor to work for the community. He also informed the gathering that it was a proud moment for everybody as this year one of the most prestigious organization of the world Rotary International is headed by its President Rtn. Kalyan Banerjee only the 3rd Indian in its 106 year history. A message from the RI President was also shown to the gathering briefing on this year’s RI theme” Reach within to embrace Humanity”. Three new members were also formally inducted to the club. The function concluded with a vote of thanks proposed by club secretary Rt. Girish Arora.